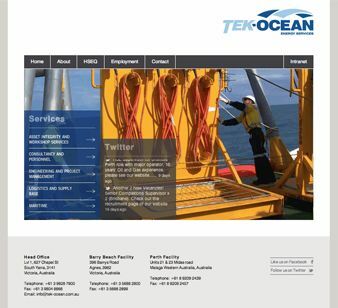 Brief: Redesign the original TEK-Ocean website which was no longer relevant to the key services provided by TEK-Ocean and to migrate the website to a WordPress CMS Platform. Solution: AndMine provided TEK-Ocean with a clear, functional website design that reflected the tone of their industry. Through providing the client with an easy to use CMS Platform they are now able to update job postings regularly and communicate relevant news through social media updates. AndMine consulted TEK-Ocean on content editing and refinement in order to clearly engage their audience and additionally encourage them to get in touch for more advanced and specialised enquiries. TEK-Ocean provided AndMine with stunning photography from out in the field and so these images were polished and edited to showcase the real life engineering scenarios against the serious nature of their content. Go on, see if you can challenge us on "TEK-Ocean Energy Services" - Part of our 159 services at &Mine. We are quick to respond but if you want to go direct, test us during office hours.